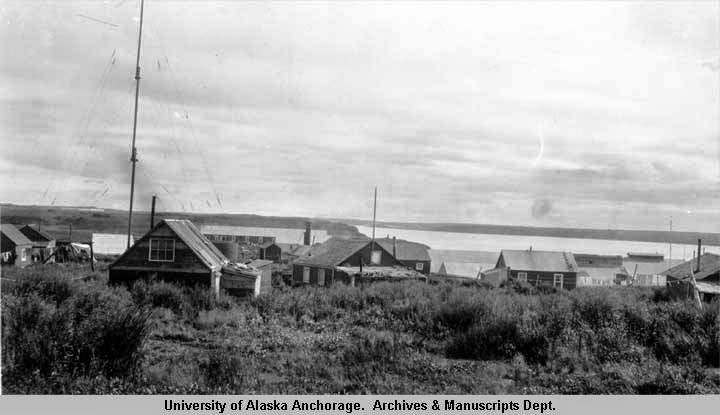 Alaska Natives possessed a variety of formal organizations before and during the implementation of IRA-based (and styled) tribal governments and ANCSA Native-operated corporations. One of these formations, cooperatives, formed in villages as instruments to bring Natives into an emerging regional economy set-up by new comers. The cooperatives came as the US business interests increasing developed enterprises that extracted natural resources such as timber and sea life from the region. In doing so, the businesses quite often blocked Native access to traditional resource sites, altering the very life ways of these Native communities. One of the consequences of being forced from traditional lifeways was that Indigenous individuals funneled into the asymmetric employment conditions of cannery work. Often governing structures possessed legally consigned financial instruments for bringing Native people into the US economy, and Native people with few options had to participate. Even before the changes in Indian Reorganization Act to include Alaska Natives, the government enrolled Native individuals into chartered stock companies. Drawing from previous posts on this blog, many Natives once indoctrinated into the reindeer herding business then faced compulsory ownership in the reindeer industry. As active investors in industry, the worked to turn a fair profit on their labor. 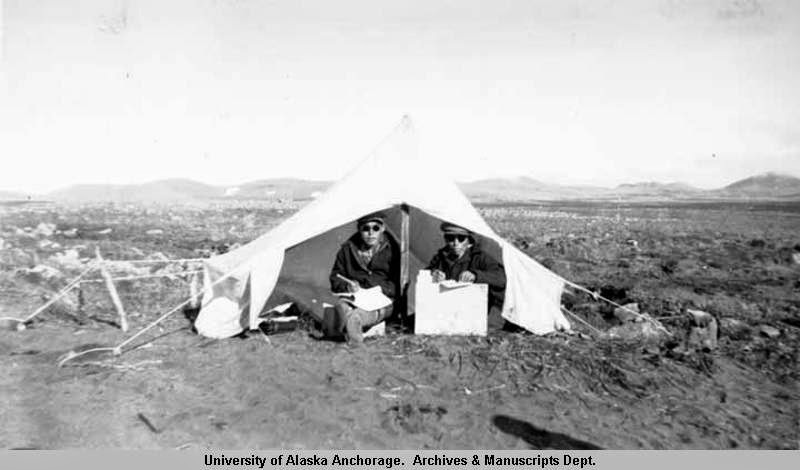 Two men, Frank Seppilu and Irving Ifkohluk, sit at the entrance of a tent, counting reindeer. Also in 1936 under provision 17 of the IRA, Native communities could organized as cooperative associations. Legal scholars David Case and David Voluck assert that these cooperatives brought together Native individuals by way of their "common occupation," rather than their "strict geographic residence." That is, the cooperatives activated in the spaces of labor activities brought together Natives through their involvement in the new territorial work force for what was surely promised to be measurable profits. Above is a newspaper article I found while conducting archival work for my current book project. 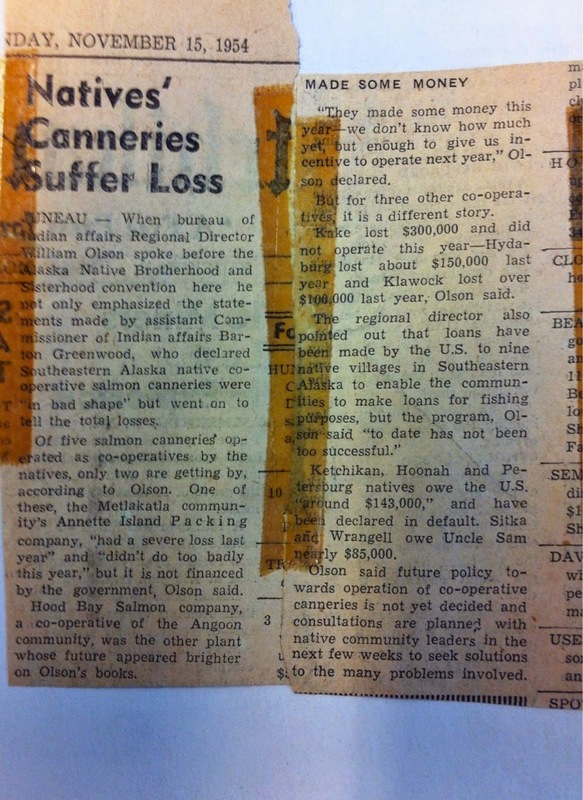 From 1954, the piece talks about how the southeastern Alaska Native cooperative canneries were in "bad shape" and suffered losses and that the "loan" programs toward these communities had "to this date not been successful." The interesting part of the cooperative business plan was that these ventures were financed through a government loan program. If these Native labor associations couldn't pay their loans then they suffered incredible amounts of debt, owed to the federal government. The article describes how some of these cooperatives were defaulting on hundreds of thousands of dollars. In the mid-20th century the burden of debt became a way to organize Native communities, under the instrument of the 'cooperative' in the mid-20th century.